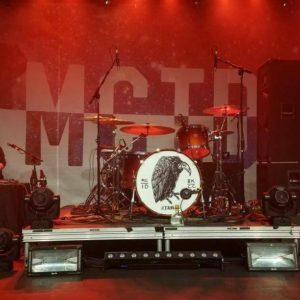 When we walked out of George’s Majestic Lounge in Fayetteville, Arkansas, we could not help but have most definitely a loss in hearing but a confidence in the live performances of modern punk and rock bands. After several glasses of water at Waffle House, my two friends and I knew we had just found our new favorite bands (if they weren’t already at the top of the list). 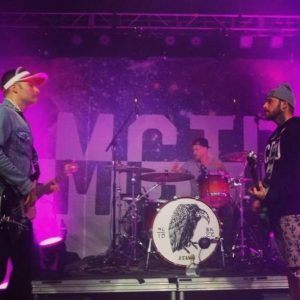 Highly Suspect and Slothrust took the stage on April 13th, 2017. Slothrust is a surf goth/punk/bluesey grunge (oh dear, did I pick yet another band that’s hard to define? Yes, but the best bands are) band out of New York with three Sarah Lawrence graduates. Leah Wellbaum, a queer musician, is the lead singer and guitarist. Will Gorin is the drummer and Kyle Bann is the bassist. 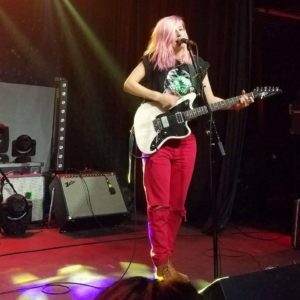 Slothrust jumped on stage about thirty minutes after the hour starting off with their purely instrumental song, “Surf Goth.” When the first note was hit, it felt like electricity being shot through your toes and stringing all the way to the crown of your head. Although this may frighten an audience, this is exactly the lively feeling you want from seeing a live show. There is a sigh of relief because you know, this is exactly what you’ve waiting for. 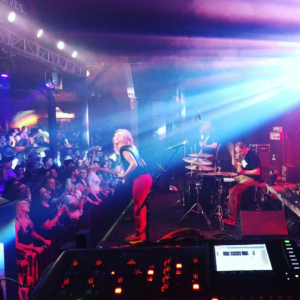 The lead singer with her now bubblegum pink hair, zombie shirt, red ripped up pants, and tan Doc Martens shredded away at the guitar. Her eyes would expand eerily and she would tilt her head, playing the guitar off balance. To audience members who had never seen this band before, she would seem like she was under some kind of influence. But this is just good ole Leah, weird and eccentric with all of her performance mannerisms. And when you add on that beautifully deep voice on top of it all, you can’t help but remember her. Other songs played that evening included singles such as “Like a Child Hiding Behind Your Tombstone” “7:30 AM” and “Rotten Pumpkin.” Even though your eyes were drawn to the lead singer for the majority of the show, you could not help but also be captivated by the drummer and bassist. The bassist would always be swaying and dancing a bit as his long curly hair would sway with him. The tight drummer would often smile while playing like he would never want to be anywhere else in the world except in George’s with these fans. As someone who has gone to quite a few concerts, I can honestly say there is nothing more meaningful than seeing a band laugh and smile while playing. I can not imagine all of the crap these bands have to deal with on a daily basis and the regular stress. But the guys from Slothrust? They do not seem to be regretting a single moment of it. I guess since there are two bands to cover in this concert review, it is probably appropriate to move on to the main act: Highly Suspect. Highly Suspect, a hard rock band out of Massachusetts (but later relocated to New York), has been nominated for 3 Grammys for best rock song “Lydia” and “My Name is Human” and for best rock album “Mister Asylum.” When they take the stage that evening, the very first thing they do is set down bottles of whiskey, beer, and vodka across the stage by each member’s designated area. Whew, were we in for a wild ride. These guys with their cactus shorts, Young and Reckless sweaters, and their Slothrust merch were beyond giving any kind of care. They started off the evening with the bluesy “Send Me an Angel” title from their new album The Boy Who Died Wolf. The next few songs played were fan favorites “Bath Salts” and “Bloodfeather” from the album Mister Asylum. These performances were incredibly loud, crazy, and overall very intense with the 3 band members jumping up and down with the crowd. With all the stress and anxiety that comes with any college student during this time of the semester, this was exactly what was needed. Even though Highly Suspect is a pretty hard rocking and sometimes goofy band, they do not cease to give their opinions on deeper content such as the political matters in “Viper Strike.” Prefacing this song with the recent news of Trump’s bombing of Afghanistan, Johnny Stevens (the lead singer and guitarist) voiced his aggravation and disappointment. It seems like that song has added meaning every single day. Throughout the rest of the evening, other songs such as “Lydia” “Vanity” and “Look Alive, Stay Alive” were played. There were six drum solos. Three different crowd surfing moments from Rich Meyer (the bass guitarist and backup vocalist) and one of the well known guys who travel alongside the band. Socks and shoes were kicked off. A Clockwork Orange theme music played when the droogs declared more mayhem during the encore. And vodka was shot across the stage out of the drummer’s (Ryan Meyer) mouth after Johnny invited him to chug it. Needless to say, he chugged more than he could handle. How about some water, guys? The evening ended with “Wolf” and I was more than stoked. It is a 7 minute masterpiece and my absolute favorite. I was finally up against the rails since the couple in front of me left early and I was experiencing this moment in pure euphoria. It was a fantastic way to end the show. It starts off sort of slow and bluesy and then it goes completely instrumental in the middle until the very end. You just get completely engulfed. Your body loses control and you feel the vibrations in your bones. It feels like your soul has been elevated or something of the sort. The feeling is like nothing else.